We offer the TruAG product lines. 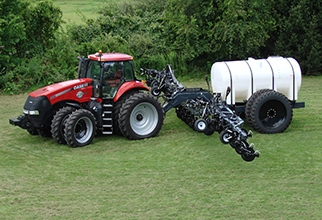 TruAG manufactures high quality products including NH3 toolbars, Strip-Till bars and units, and seed tenders. We sell and support the full line of TruAG products except for seed tenders. For seed tender sales and service, please contact Solid Rock Farms in Wolcott, IN. Click above to go to TruAG's site for additional product information. TruAG Avenger Series anhydrous toolbars are designed with your up-time in mind and to assure years of service. Offerings include 1300, 1500, 1700, 1900, and 2100 models. For more information, click above to go to TruAG's website for more information. TruAG's Nitrator 2500 28% liquid applicator featuring 25 rows the Nitrator provides both efficient and effective liquid application and is the perfect companion to our Avenger series. TruAG Seed Tenders are available in 2 or 4 box tops with adjustable poly or poly-cupped auger, tandem axle trailer and is ready to use. For more information on seed tender sales and service, please contact Solid Rock Farms in Wolcott, IN or click on the TruAg logo above. For TruAG seed tender sales and service, please contact Solid Rock Farms in Wolcott, IN.